Lucy is a long time shopper at Adrians…we always enjoy seeing her come to visit us! Here is one of the most delicious Banana Breads…and when baked in a Bundt pan, it just seems extra special. Thanks Lucy! Blend all ingredients in one bowl. 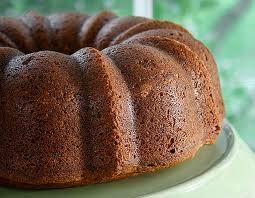 Pour into a greased 9 inch Bundt pan or into two loaf pans. Bake at 350° for approximately 50-60 minutes. Set aside on rack to cool without removing from pan. When cool, turn out onto plate.